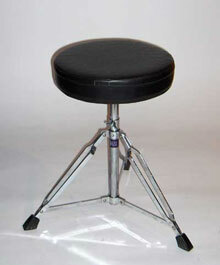 The drumset seat or "throne"
Drumset seats or stools (or often called drum "thrones") have a specific shape adapted to the necessary ergonomics to play with pedals. I don't recommend to save it, which would expose yourself to a discomfort minimizing your playability and significantly increasing the chances of back problems (see "posture" at "health"). Moreover, there are cheap drum seats of good quality. The seats are rarely sold with standard drum kits which is why you can tend to neglect their buying however necessary in my opinion. What are the characteristics of a good drum seat (or drum throne)? The orientation of the seat affects the position of the whole body. The horizontal position will also allow to easily stay balanced on the buttocks, which is necessary for the play with toe tense ("heel up"), where both feet may leave the ground simultaneously. Most normal armchairs are back tilted, causing even greater curvature of the spine (to prohibit absolutely). Note that for the seat to be horizontal, it must also be the soil. Pay attention of it because the drummers must often play in places quite "improbable" (barn, disused workshop, etc.) to avoid disturbing the neighbors. Whether turning the seat on a screw or by sliding with two telescopic tubes, it is important to have the possibility to adjust the seat height subtly, because the ideal angle that you must find with the knees and the hips (again see at "posture"). As we have seen, a drummer must often rest his full body weight on his buttocks, hence the need for a hard padding (elastic: dense latex with bubbles) and thick. Bones should under no circumstances touch the bottom of the seat (or hematoma is assured (see "wounds")). Feel free to try it yourself in store, by lifting the legs, to be sure of that. My favorite is the traditional stool perfectly circular. But there are also "motorcycle saddle" shaped seats or intermediate (with just two small notches) to enable legs to lift better up and down ("heel up" playing). Some drummers also use an elongated and thin chairback in motorcycle type again ("chopper"). But I find it unnecessary, unless if you lean the whole set back (as Joey Jordison or Mike Terrana), each element (leg) of the drumset being riveted to a metal plate (ground) removable. Leather or terry towelling to absorb sweat, and not plastic, which encourages more sweating (bad, see at "warm up"). For easy transport. Note that the seat shall be removable from stand, for the same reasons. The tripod allows not interfering with the legs and an implantation less cumbersome. A double braced here is quite necessary. 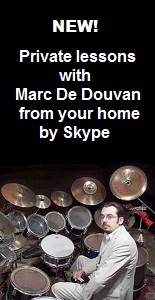 Rubber or plastic at the ends of legs, like the cymbal stands are also useful to avoid sliding and ground degradation.